Photo from Chauntyll Allen, now widespread. I saw the racism in the Minneapolis Fourth Precinct tree instantly. So I did what so many of us do in this social media age. I took a screen grab from a friend's Facebook account, put it up on my Twitter feed with a demand for our elected officials to address it, and went back to my day. I figured I'd contribute to the chorus of calls for apologies, consequences, and reconciliation. As it turns out, that tweet was one of the first to spread the image broadly, and became a focal point for many people and news agencies. The most important aspect of understanding the racial undertones is context. After ten years on the northside, I now live in Superior, Wisconsin. And most Superiorites that I spoke to who weren't familiar with Minneapolis reacted by saying, "Well, *I* like Funyuns and Natty Ice and fried chicken and Newports. So do lots of people. I'm not sure what Takis are, but I'll try 'em." Or, "Lots of White people like those things too, so obviously there's no racism there." Sure, people of all races like those things. One of my best friends who smokes prefers Newports, and another close friend's favorite beer is Old E (not in the picture, but a beer heavily marketed to and sold in African American communities). Both of these friends are White, and saw the racial animus behind this tree instantly. And if you're not a level seven vegetarian, who doesn't like fried chicken? I think we can all agree that Popeye's is the best chicken fast food joint. But in a food desert like north Minneapolis, the part of the city patrolled by the fourth precinct, Funyuns, Takis, hot Cheetos, and fast food like Popeye's are more heavily consumed than in other parts of the city. Those items as well as the brands of beer and cigarettes, have traditionally been marketed towards African Americans. To those of us who have lived over north, the symbolism behind these items was apparent immediately. To add fuel to this fire, the Minneapolis fourth precinct was the center of a weeks-long protest after a police officer on the northside shot and killed Jamar Clark, an African American. 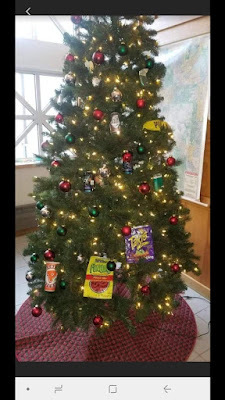 (that context is for readers unfamiliar at all with north Minneapolis) So the list of things that might be offensive to the community at large that could go on a Christmas tree should start with: 1. We'd better not do that. After the people without much direct interaction with communities like north Minneapolis, that's where we really get into a bevy of excuses that don't hold up. Again, the key here is context because in a different setting with different people making something like this, the message wouldn't be the same. And fellow White people, let me just call out a behavior we're guilty of far too often. When a person of color points out racism, we can fail to acknowledge that experience and then we start with a whole series of mental gymnastics to convince ourselves that racism isn't racism. We need to do better, myself included. People have said that the Christmas tree looks like it could be litter that was picked up from the neighborhood. Except it was not litter that was picked up by active neighbors. People have said that the Christmas tree looks like it could be stuff that a college kid would put on a Christmas tree. Except that it was not put together by college kids. People have said that this Christmas tree looks like it could be items from a convenience store, especially one on the northside. Except that this Christmas tree was not put together by a convenience store owner or patron. People have said this was just plain funny, and that the politically correct crowd should just lighten up and not see racism lurking around every corner. In general, reasonable people can disagree about when PC culture goes too far. But in the context of a tree in a lobby of a police department in the heart of an African American community that is still raw from multiple police shootings of Black men, this is not the place to push those boundaries and the police department certainly shouldn't be the ones doing so. People have said that all of these items and more, police tape included, are things found far too often littered throughout the northside. That's true, but the police department has not offered up an excuse that this was meant to be a statement on litter. People have tried to dismiss the tree as dark or gallows humor that was not intended to be taken in a different way. This I can understand, I myself have said things in private that, if they were taken without any context whatsoever, could be interpreted as derogatory towards North Minneapolis. Many of us use dark or inappropriate humor as a way to either cope or to tell the truth about the world around us. But this tree was not put up in an officer's home or in a part of the precinct closed off to the public. It was on full display in the lobby, which incidentally is a Toys for Tots dropoff site. So no matter what excuse you want to come up with, understanding the context of this community demands that one accept at least that this tree was put up with no consideration as to how it could be perceived. I consider it more than a little likely that there was some degree of conscious and intentional racism behind this. In response to the hubbub, mayor Jacob Frey declared that the officer would be fired by the days end. Frey obviously had no authority to make that final decision because the officer is protected by a whole bunch of statutes and legal or union procedures. Since then, officers have been demoted, put on leave, and had serious disciplinary proceedings begin. I support what Frey said and did 110%. And here's why: when you call 911 and it takes an officer far too long to respond, and when they do you get the tired line that, "Hey, this is north Minneapolis, what do you expect?" The officer with that attitude is likely to be the kind of officer who puts up this tree. When a car full of Black youth gets pulled over and the kids are put in binders and made to sit on the corner while the cops bring in the K-9 unit to sniff for drugs even though the traffic stop was minor and there was no overt sign of drug paraphernalia, the cops who do that are the kinds of cops who would put up this tree. When a Hmong father is pulled over for driving a Honda Civic because "a lot of these cars are being stolen by chop shop and street racing gangs," the policeman with that prejudice is the kind of policeman who would put up this tree. When officers respond to a legitimate call for life-threatening situations and they come in with guns drawn even though de-escalation was still a possibility, the officers who do that may well be the kind of officers who would put up this tree. I've often said that the buzzword of racial equity is not necessarily put into practice through huge initiatives but instead through the daily and tiny interactions local government has with disaffected communities on a regular basis. Unfortunately, the inverse is also true. What seem to be small slights of inadvertent racial insensitivity are too often indicators of a much deeper sickness. To me, that's what this tree represents, and that's why the response has to be equal to the offense.